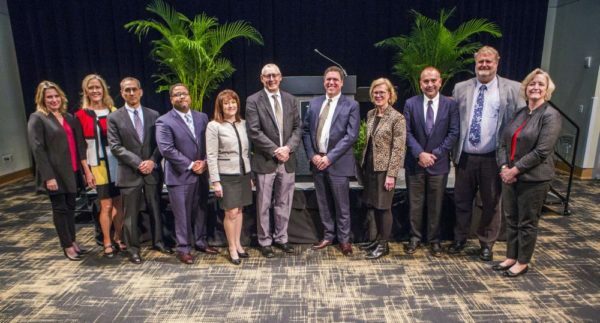 Vanderbilt University’s 10 newest endowed chair holders were lauded for their exemplary teaching and scholarship during a Nov. 27 ceremony at the Student Life Center. 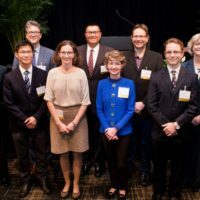 Provost and Vice Chancellor for Academic Affairs Susan R. Wente noted in her opening remarks that this group of chair holders represents a wonderful cross section of disciplines across six of the university’s schools and colleges. 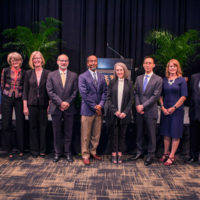 She expressed gratitude for the generous donors who make it possible for Vanderbilt to recruit and retain these and numerous other top scholars. Deans John Geer, Chris Guthrie, Jeff Balser, Larry Marnett, Linda Norman and Camilla Benbow described the accomplishments of the new chair holders in their respective schools: College of Arts and Science, Law School, School of Medicine, School of Medicine Basic Sciences Division, School of Nursing, and Peabody College of education and human development. Lisa R. Young, Janie Robinson and John Moore Lee Chair in Pediatrics. The ceremony concluded with Wente thanking family members, friends and colleagues of the honorees for supporting the faculty members’ achievements. The celebration marked the 28th event to honor faculty members named to endowed chairs. A total of 277 chair holders have been honored since the initiative to recruit and retain outstanding scholars and teachers was announced by Chancellor Nicholas S. Zeppos in August 2010.